Hi all! There have been lots of changes in the Industrious Hygienist's life lately (hence the sad lack of posting and mangas). Before I entertain you with tales of moving out of town, selling a house, finding a rental in the new town that would take my giant dog-beast, and convincing my employer that I can telecommute effectively, I bring you a long-awaited manga. Special thanks to the people featured in this manga (you know who you are). I love coming to your facility, working my tail off, and hanging out with y'all. I numbered the way you are supposed to read this one - I haven't done a manga in a while and my formatting is wonky and not entirely logical. Once I find my *new* and *shiny* software in my unlabeled :( moving boxes and convince my brother-in-law to part ways with the Bamboo tablet I allowed him to borrow, I plan to venture into the realm of digital art. 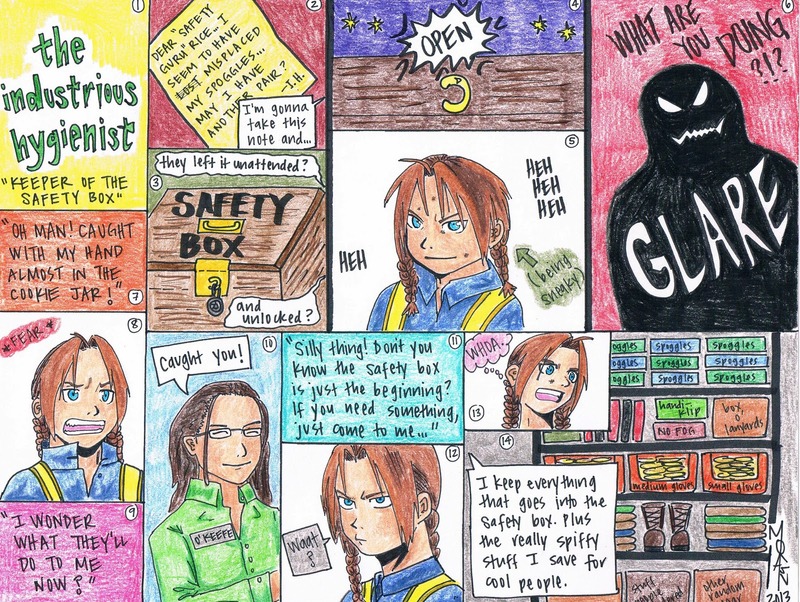 As always, thanks to the artists/creator of Fullmetal Alchemist for creating such wonderful, drawable characters. Eventually I will be able to draw some original characters, but until then, I will borrow/edit/copy/attribute/love your characters.